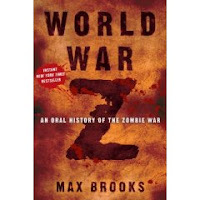 World War Z: An Oral History of the Zombie War by Max Brooks. Library copy. Zombies. They attack. They almost win. Now, a decade later, an oral history has been assembled, from the doctor who treated "Patient Zero" (the first documented Zombie) to the American soldier who fought at the Battle of Yonkers, from the feral child who survived on her own to the South African who invented the notorious plan that ensured human survival at the cost of millions of lives. What else? Since the war is over and the survivors are being interviewed, we know that people lived. But how? At what cost? And how exactly do you survive when a zombie attacks? Part of what I liked is how both the "back story" of those with knowledge is told, along with the suburban mom who didn't realize the threat until the Zombies came thru the living room window. As with other oral histories, the book moves from narrator to narrator. Would you survive? According to the official web site, I have about a 35 percent chance of survival. The website keeps up to the "real" attitude of the book by including podcasts of those "interviewed" for the book. This isn't a zombie gore-fest; it's rather a fear-fest, and I guarantee you by the end of the book, you'll be contemplating a home renovation to include steel doors, shatterproof glass, and disappearing stairs. Who would like this? It's for fans of horror, science fiction, adventure, and survival fiction. Brooks is the author of The Zombie Survival Guide. Which, according to the book jacket, "formed the core of the world's civilian survival manuals during the Zombie War." It was published last year, making it one of the Best Books Read in 2007. The review at Rock and Roll Librarian. The Zombie Survival Guide Website. I'm not a fan of horror, but I was definitely gripped by Life as We Knew It. I put World War Z on hold based on your recommendation. I may have to read it by peeking through my fingers, though. Thanks for the review. This sounds like an intriguing read. The audio book on this is awesome as well. Brooks must have called in some favors from his Dad, Mel, as the cast includes people like Rob Reiner, Alan Alda and Mark Hamil. Quite possibly the best book I read last year. I can't believe I hadn't previously heard of this one, esp. since I actually own The Zombie Survival Guide. It's now on my list. Thanks, Liz! You are so right about it being a FEAR fest as opposed to a gore fest. One of the most fascianting yet horrifying premises of the book was that the zombies were not our greatest threat it was fear and ignorance that was our greatest enemy!